Overview: Welcome to a new era in Marvel Comics, as we dive into the adventures of Ms. Marvel. Longtime Marvel readers should already be familiar with Carol Danvers, a security officer at a military base when Captain Marvel first landed on Earth. (It will be several months before I get around to reviewing Essential Captain Marvel Vol. 1 where we see her debut, so take my word on this.) In Captain Marvel #18, Carol is caught up in an explosion with the Kree captain. As a result, Carol Danver’s DNA now contains Kree DNA, which means she now has the same powers as Captain Marvel – superhuman strength, endurance, the ability to fly, and a precognitive sense. When Carol blacks out, her body undergoes a transformation and appears in costume (and with a new hairdo) as Ms. Marvel. When our book starts, Carol Danvers has left the security world behind to become a magazine editor, working for the most bombastic publisher in New York City, J. Jonah Jameson. He is wanting to launch a women’s magazine and hires Danvers to oversee the publication. Being in New York puts her right in the middle of everything going on in the Marvel Universe. She crosses paths with Spider-Man and the Avengers, eventually becoming a member of that team. While Ms. Marvel does face off against some traditional Marvel villains such as M.O.D.O.K., the Scorpion, and Tiger Shark, she also faced off against new characters created for her book. While some were lame (Steeplejack, anyone? ), two new ones would come to the plague the X-Men for years. In issue #9, we meet Deathbird, who would later be revealed to be the older sister of Princess Lilandra of the Shi’ar Empire. But the big baddie came in issue #16 when the shape-shifter Mystique is introduced. Mystique will kill Carol’s boyfriend, Dr. Michael Barnett, whose murder will not be “solved” for 13 years (see Footnotes below). What makes this Essential? : This should be an important book, more important than how it is viewed. The Carol Danvers character has been active in the Marvel Universe since her debut in 1968. Ms. Marvel was the first of four female-led books that Marvel launched in the late 1970s/early 1980s, all of which would go on to be major characters for Marvel. Outside of the first three issues, this book is written by Chris Claremont, who has proven to be one of Marvel’s best writers ever. So why isn’t this better received or appreciated? Well, my first thought is that she is ignored because she is a derivative character. Following the lead of DC’s Supergirl and Batgirl, Ms. Marvel is a female copy of Captain Marvel. I think a lot of readers approach derivative characters just as a money grab from the publishers, who believe that readers will follow the costume regardless who is wearing the costume. That leads to my second thought – Ms. Marvel’s costume. For her first costume, she wore full-length sleeves, but bare legs, back, and belly. Her second costume was a little better – a one-piece swimsuit with a sash, thigh-high boots, and gloves that went up past the elbow. I realize that these are just characters, primarily created by men, and the goal is to sell comics, which are primarily purchased by men and boys. But neither of these outfits was extremely practical in the heat of battle nor are they necessarily appropriate for a character billed as such a strong feminist. Footnotes: Ms. Marvel was canceled following issue #23, despite a blurb for issue #24 (and presumed issue #25). The final stories were eventually printed in 1992 in Marvel Super-Heroes Magazine. The stories in this Essential volume are printed in story-order, so Avengers Annual #10 is printed after the Marvel Super-Heroes stories, even though it came out 10 years earlier. In addition, the cover art for issue #24 is included in this volume. If Ms. Marvel #25 had been published, that would have been the first appearance of Rogue, Destiny, Pyro, Avalanche, and the Hellfire Club. It even establishes that Carol Danvers is friends with Wolverine. With the exception of Rogue, Chris Claremont would later introduce those other characters in the pages of Uncanny X-Men. Avengers Annual #10 was also reprinted in Essential X-Men Vol. 3. Prior to reading Avengers Annual #10 in this Essential, readers are advised/encouraged to read Ms. Marvel’s adventures as a member of the Avengers. In particular, Avengers #200 (which can be found in Essential Avengers Vol. 9) is a must read for the proper understanding of the events of Avengers Annual #10. If you like this volume, try: the Ultra mini-series from Image Comics. Created by the Luna Brothers, Ultra tells the story of three super-heroines who work to protect Spring City. Pearl Penalosa aka Ultra is the main star of the title and in the city. She’s beautiful and rich, but sadly single, having thrown herself into her career. How in the world does anyone find time to meet someone, much less date, when the city is in constant danger. What stood out for me were the covers to the individual eight issues – each one was modeled after a popular magazine, such as Time, Rolling Stone, People, Wired, and others. This was the breakout debut for Josh and Jon Luna, who would go on to do other series for Image Comics such as Girls and The Sword. Ultra is still available as a trade paperback, but I believe the back issues could still be easily found in the back-issue bins. This entry was posted in Marvel Essentials, Ms. Marvel and tagged Carmine Infantino, Chris Claremont, Dave Cockrum, Gerry Conway, Jim Mooney, John Buscema, Michael Golden, Mike Vosburg, Ms. Marvel, Sal Buscema. Bookmark the permalink. 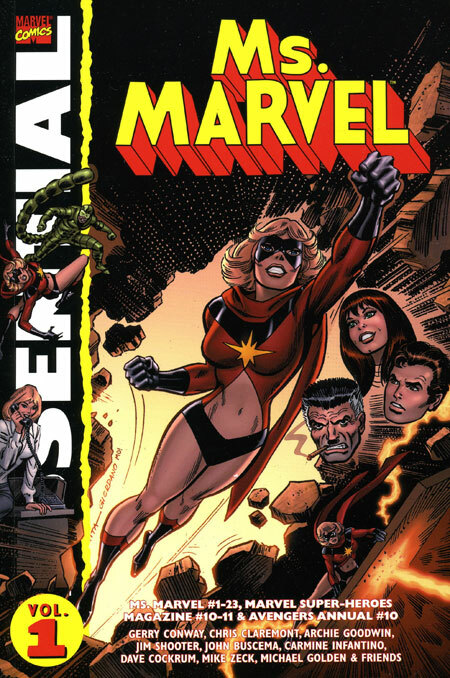 Pingback: Essential Ms. Marvel Vol. 1 | Worst. Comic. Podcast. EVER! Pingback: Throwback Thursday – Essential X-Men Vol. 3 | WORST. COMIC. PODCAST. EVER!